Whether I’m just starting a CRM project, or there’s a list of [something] that someone needs imported into Dynamics CRM. One of the easiest ways to get a list of records imported is using a file import…and the biggest hassle of that is making sure the field mappings are set up. The vanilla product has an easy way of handling this, providing a way to download a template, specific to the record type you want, which includes all of your customized fields as well. It’s pretty slick not having to set up this field mapping on your own, and if you have some Excel data that you can copy/paste into the appropriate columns, you’re in business. 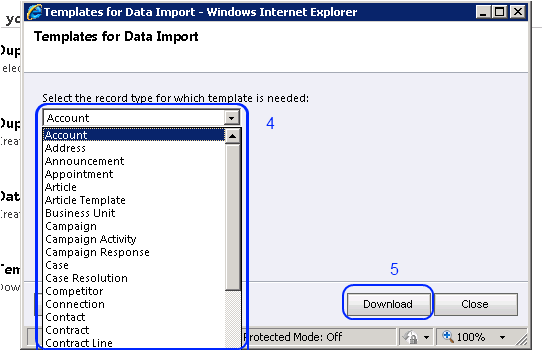 Objective: Download the import templates specific to your organization from the CRM application. Permissions Required: All default security roles. In the navigation pane, click Settings. A window will pop up. In the dropdown, select the type of record you will be importing. Once selected, click the Download button. Save the file to the desired location. Repeat steps 4 , 5, and 6 for each record type template.